DC Comics, where Sam Simeon (a gorilla) runs a detective agency and moonlights as a cartoonist, Grodd (also a gorilla) is a super villain who used to antagonize The Flash, and there are Green Lanterns that strongly resemble chipmunks and shaggy dogs. Bobo learned all this with the help of trainer Fred Thorpe of Oscaloosa County, Florida. In a story written by John Broome (Atomic Knights, Elongated Man) and drawn by Carmine Infantino (Black Canary, Nova), Thorpe was murdered, and Bobo helped Oscaloosa Sheriff Edward Case bring in his killer. It appeared in the back pages of Rex the Wonder Dog (which starred another animal with incredible abilities) #4 (August, 1952). 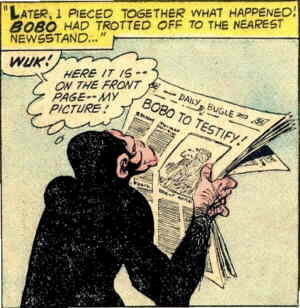 Broome and Infantino had earlier collaborated on the creation of Captain Comet, and their The Phantom Stranger came out contemporaneously with Bobo. Later, they collaborated on Kid Flash. From then on, Case and Bobo were a team, and it's hard to be sure which was the more valuable member. They skipped #5, but from #6 on, tracked down crooks and put them behind bars in every issue of Rex's comic until 1959, when the title bit the dust. But after that, they weren't so much as mentioned in a DC comic book for decades. They didn't even show up in Justice League of America #144 (July, 1977), where Vigilante, Robotman, The Challengers of the Unknown and practically every other 1950s DC-owned adventure hero got together, even Rex. After a brief cameo in Crisis on Infinite Earths in 1986, Bobo was finally brought back in Secret Origins #40 (May, 1989). Apparently unable to accept such a character on his own terms, writers Andy Helfer and Rusty Wells, with artist Mark Badger, gave him a superhero-style origin. Back in Africa, before he was captured and sent to Florida, a couple of teeny-weeny but otherwise chimp-like aliens named Y-Nad and K-Ram got inside Bobo's brain and modified it from within. This made it easy for him to benefit from Thorpe's training. Later, he and and the star of his original venue, Rex, found the Fountain of Youth, which explains why they're both so active after all these decades. But to avoid complication, they wouldn't be able to find it again. Now fluent in several languages (despite the fact that those aliens did nothing to his larynx), Bobo lives off of his investments, but still dabbles in detective work and sometimes works with the U.S. government's Bureau of Amplified Animals. For a long time he made only occasional appearances in comic books, functioning as just one more oddball facet of the DC Universe. More recently, tho, he's been hanging around with Blue Devil, Black Orchid and other series-less DC characters, as part of Shadowpact.